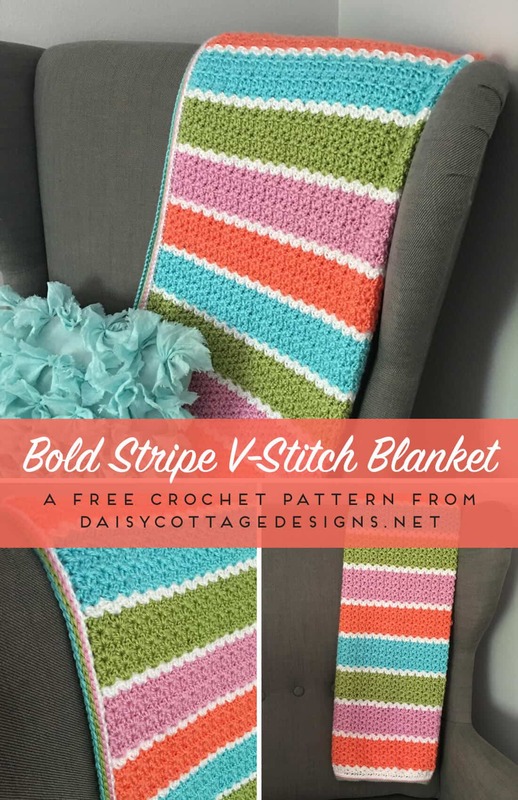 Of all the free blanket crochet patterns on the Daisy Cottage Designs website, this one might be my favorite. 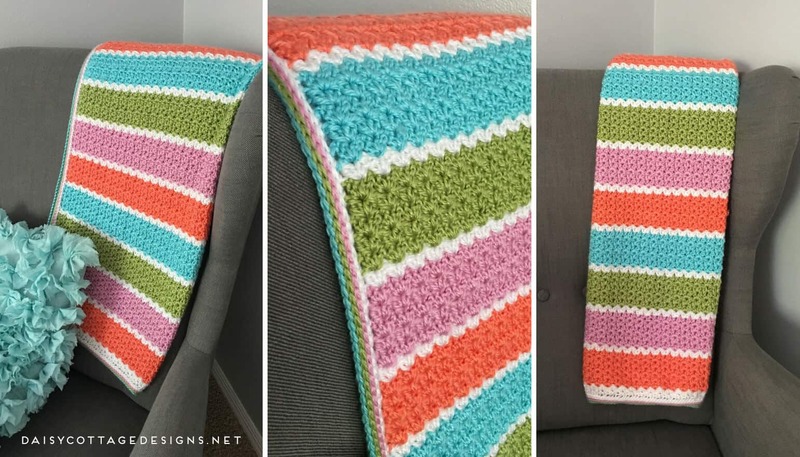 From the bright and cheery colors, to the beautiful cluster v-stitch, to the simple border – everything about this blanket puts a smile on my face. 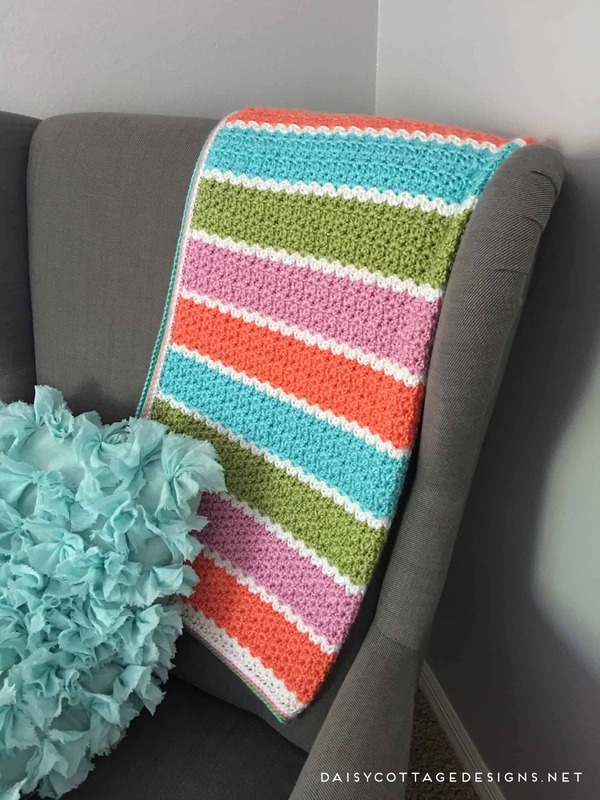 This bold blanket is fun to make because the repetitive pattern works up quickly. With the instructions given below, you can make this blanket any size you’d like. 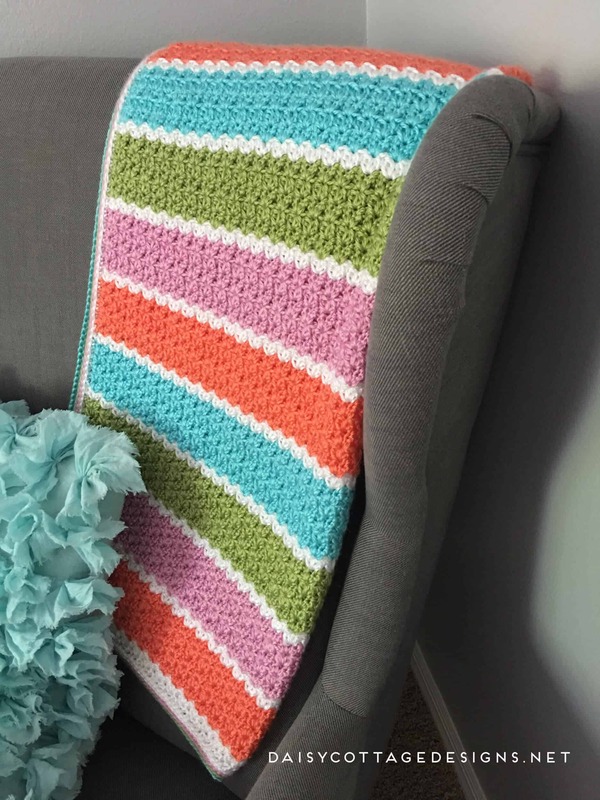 This crochet blanket would look beautiful in so many color palettes. If you’d like some colors inspiration, check out my Color Combinations Pinterest Board! Worsted Weight Yarn. I used 1 skein each of Yarn Bee Soft Secret in the following colors. Finished size as I made mine is approximately 30×30 inches. 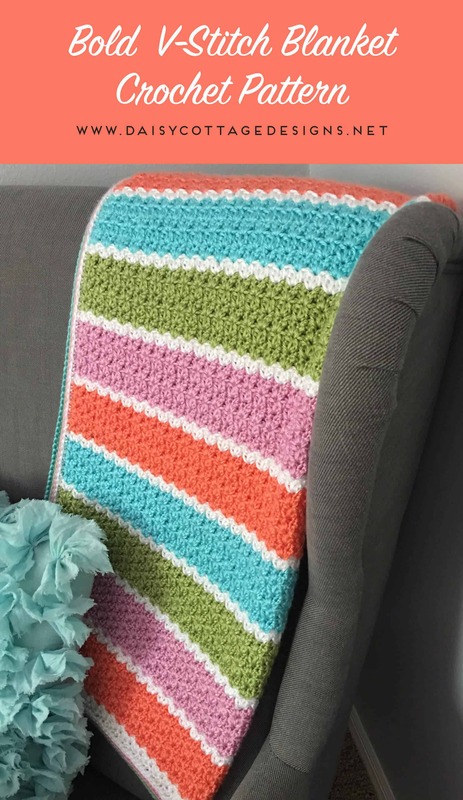 To make this blanket in the size you like, make your starting chain in a multiple of 3 and continue adding length until your blanket is the size you like. Remember, this will affect the amount of yarn you need. Cluster V-Stitch: work the following in the SAME stitch: dc2tog, ch 1, dc2tog. If you’re not familiar with these terms, here are more detailed instructions. Yarn over and insert hook into the stitch. Yarn over, pull up a loop. Yarn over and pull through two loops on your hook – two loops should remain. Leaving two loops on your hook, yarn over and insert hook into the SAME stitch. Yarn over, pull up a loop. Yarn over, pull through two loops. You should now have three loops on your hook. Yarn over, pull through all 3 loops. If you would like to see a video to help walk you through, check out this one. Please note that she works 2 chains between her clusters and I only work 1. Using white, chain 120 (or any multiple of 3 to create a larger or smaller blanket). Row 2: The ch 2 counts as the first stitch. Skip the next stitch. Cluster v-stitch in the next stitch. *skip 2 stitches, cluster v-stitch in the next stitch* until two stitches remain. Skip the next to the last stitch and dc in the last stitch. Cut yarn and weave ends. Row 3: Join mango yarn with a sl st. Ch 2. Cluster v-stitch in each ch 1 space across (so you’re working into the middle of the cluster v-stitches that you made in the previous row). Dc in the top of the ch 2 from the previous round. Ch 2, turn. Row 4: Cluster v-stitch in each ch 1 space across. Dc in the top of the ch 2. Ch 2, turn. Rows 5-7: Repeat row 4. At the end of row 7, cut yarn and weave ends. Row 8: Repeat row 3 using white. Rows 9-13: Repeat rows 3-7 using pink. Row 14: Repeat row 3 using white. Continue to repeat the pattern until you’ve reached your desired length. To complete this blanket, I did a camel stitch border. If you’re not familiar with the camel stitch, here’s a video explaining how to do it. Round 1: Using white yarn, sc evenly around the blanket being sure to work 3 stitches in each corner. Round 2: Using pink yarn, camel stitch sc in each stitch. Work 3 stitches into each corner. Round 3: Repeat round 2 with avocado green. Round 4: Repeat row 2 with aqua. In full disclosure, the camel stitch does not work well with a yarn that doesn’t stretch much. If you’re using the same yarn as I did, you’re going to want to pass on the camel stitch border. It’s painstakingly slow unless your yarn has some give. However, if you do want to give it a try, I recommend going up a hook size and working loosely. 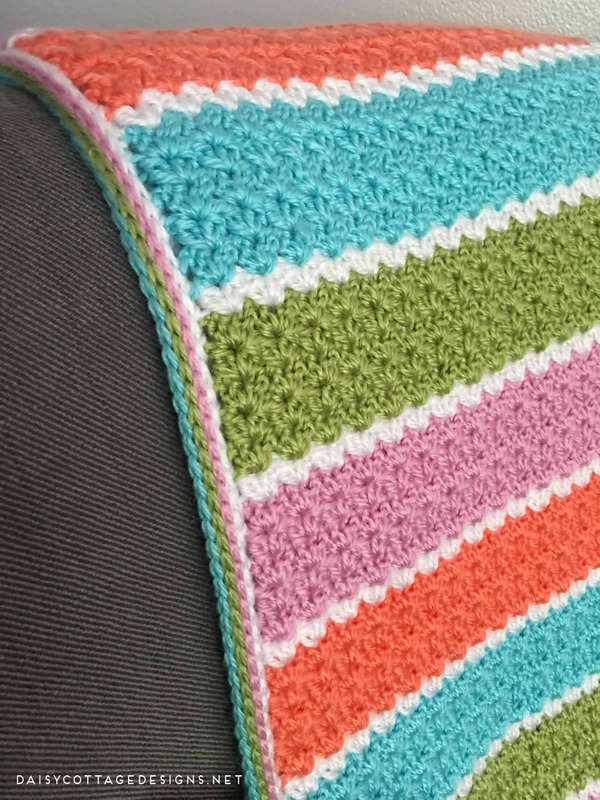 If you’d like your blanket to have the same look as mine without the hassle, I”d go with a simple singe crochet border. Round 1: Using white, sc evenly around the blanket being sure to work 3 stitches in each corner. Round 2: Repeat round 1 using pink. Round 3: Repeat round 1 using avocado green. Round 4: Repeat round 1 using aqua.